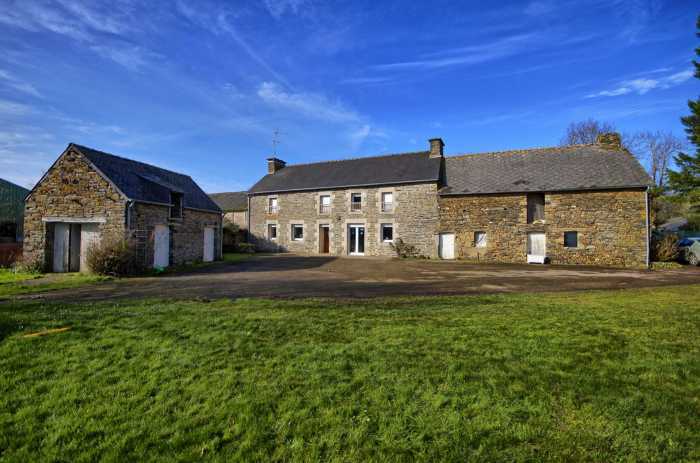 Set in a large hamlet to the North of the Lac des Ducs and the large town of Ploermel, is this lovely old farmhouse with plenty of outbuildings. Set in just under an acre of enclosed with centennial oak trees and great views out to the south towards the lake. The house itself offers a very large open plan living room with fitted kitchen and fireplace, a room that lends itself to being either a downstairs bedroom or a study, then to the rear you have a corridor, utility room, WC and a shower room, this leads on to a large "cellar" room and then a large carport. Upstairs you have three large bedrooms, a bathroom and a converted loft room, which would take much to convert to a fourth bedroom. Adjoining the accommodation to the East side is a unrenovated house on 3 floors, to the West a large hangar in two parts; then a small stone barn completes the outbuildings. 4 Bedrooms 188m2 living space. Town centre, Shops, Primary school, Hospital/clinic. Lake. Doctor. Sea. Public pool. Supermarket.